FAYETTEVILLE, Ark. — Seeds. Soil. Soybeans. Drones? More than 150 high school students from around the state attended the ninth annual Environmental and Agricultural Sustainability Field Trip on Sept. 26. The University of Arkansas department of crop, soil, and environmental sciences hosts the event every year at the University of Arkansas System Division of Agriculture’s Arkansas Agricultural Research and Extension Center. 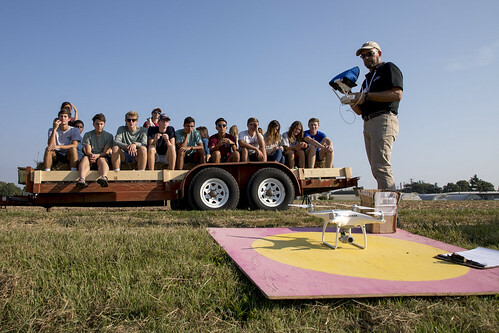 Holly Yeatman, recruiting coordinator for the CSES department, said the event connects students with environmental and agricultural experts for hands-on experiences related to what they’re learning in the classroom. “So many of the things that we talk about and show students are directly related to their curriculum,” Yeatman said. One of Ethridge’s students, Stephanie Jones, thinks learning about sustainability is important for all high school students. “It’s going to affect everybody later in the future. It’s definitely something that we should take interest in,” she said. Students arrived at the research and extension center first thing Tuesday morning. Following a brief welcome address from Yeatman, students split into small groups and loaded into rustic hay wagons toted by tractors. Each group visited stations led by faculty and personnel of the CSES department and visiting specialists from the Beaver Water District. Each session lasted about 15 minutes and introduced students to sustainability concepts that are shaping the future of agricultural practices and environmental management. Two tours, each with six stations, covered a wide range of topics, including water resource management, soybean breeding and erosion control. A biodiesel plant demonstration was particularly popular. Used cooking oil from University of Arkansas dining halls is recycled into biodiesel fuel that powers farm equipment at the research and extension center. Another favorite session demonstrated how researchers like Dr. Larry Purcell are using drones to improve soybean production. Andrew McGlynn and Emily Efurd thought the drone automation was especially interesting. “You can program it and make it go on its own missions by itself,” McGlynn said. Purcell, CSES professor and holder of the Altheimer Chair for Soybean Research, said technology like drones are becoming more and more common out in the fields. “What we talked about here today is really just the tip of the iceberg,” he said. Yeatman said future CSES career openings are expected to exceed the number of qualified graduates, making events like the Environmental and Agricultural Sustainability field trip a great chance to introduce high school students to opportunities they might not have considered. “It kind of gives them a hint of what we’re going to learn in class and what they can do as a career after they graduate,” said Jade Cameron, agriscience educator at Fayetteville High School. Cameron said she appreciates being able to refer back to the trip throughout the year and plans on bringing her students on future field trips like this one. “The kids really enjoyed it this year. It gets them excited,” Cameron said. To learn more about the impact of agricultural sciences in Arkansas, contact your local Cooperative Extension Service agent or visit www.uaex.edu.